I have come to the conclusion that I started nesting without realizing it. At this moment, the house is very nearly perfect. No laundry, sweeping, filing, organizing or anything to do. Also, I'm getting down to the deep things and tearing them apart just so I can reassemble them. I didn't realize it had hit until I looked around today and realized that I didn't really have much to do. There isn't even one dirty dish in the sink! So, I decided to start tackling some wedding photography editing. It's only been a year; why not get started on it? I also played with my new camera and took some pictures of a few of my keepsakes as well..but that's all for another posting. I organized the baby things we've gotten. 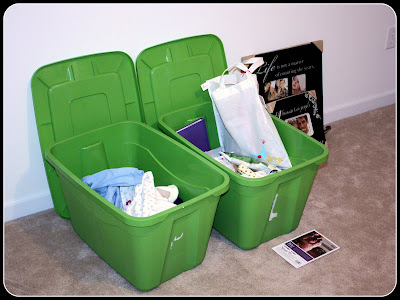 I put bathroom things in the closet, bedding things in the crib, clothes in one box to be washed when I get some baby-safe detergent and another box for all random things we've received like stuffed animals, diapers, formula, etc. It's weird what you get in the mail when you become pregnant. I don't know how they are finding us to send us this stuff but I'm grateful. Formula was odd, though. It's funny. I went 6 months with no motivation to do anything and now, within a couple of weeks, I've done just about everything I can do. Now I'm bored. But soon the fun stuff will start: painting, moving in furniture, putting away things from baby showers (all 3).....and then there's that kid that's gonna come along before too long too. I hear they keep ya busy. 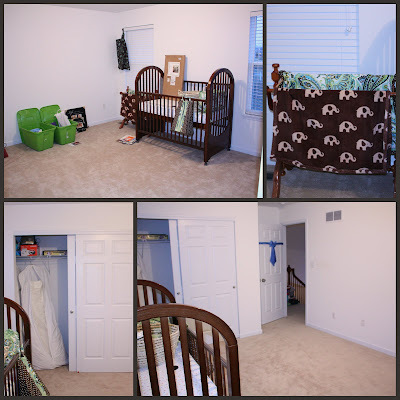 The nursery is ready to go. See... All it needs is some paint and some furniture....Oh, and a baby. 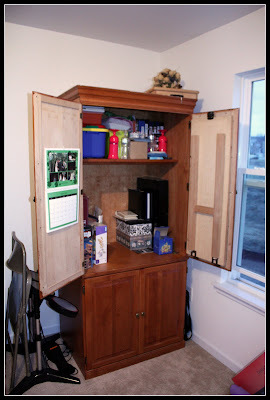 I even got down to the nitty-gritty and overhauled my craft hutch. It is completely ready for the barrage of nursery decorating-related projects that are about to ensue!